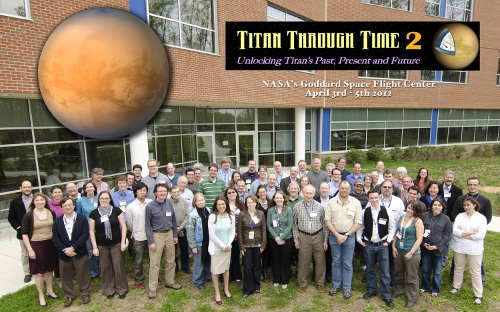 We are pleased to announce a second workshop on "Titan Through Time" in 2012, following the success of the 2010 workshop. The second meeting will have a similar format, with a 2 1/2 day science program comprised of themed sessions, and featuring a mixture of invited reviews, and contributed talks and posters. Abstracts and registration are required by February 15th to allow time for badging. Additional information on speakers, the conference venue, and accommodations are available on this web site and will be updated regularly. We hope that everybody had a safe walk/drive/flight back home. You can download the group picture using the link below. Thanks again for attending our workshop! We just posted very IMPORTANT information on how to get your badge. Follow me! Our lodging page got updated again. Check it out! We posted instructions for talks and poster. Food order submission is now closed. Official registration is now closed. Questions regarding the organization of the workshop? Having trouble while using the website? If you believe that your work (or the work of a third party on whose behalf you are entitled to act) has been copied in a way that constitutes copyright infringement, please let us know and we will try to resolve it as soon as possible. © 2009-2011. All Rights Reserved. Designed by Nicolas Gorius and Valerie Klavans.